The terrified watchman burst into the Great Lakes Towing company office and swore that an unseen hand had doused a lantern that he had left in a corner…. The watchman crept up on the tug Record anchored at the Duluth dock and eased aboard, holding his lantern high in front of him. Suddenly, something blew out the lantern. It wasn’t the wind because it was one of those bone chilly nights on the docks when the wind curled up in the corners stirring only occasionally. The watchman swung his lantern, searchingly. After all, Captain Byron Inman had died just three months ago in February 1903, and everyone knew that the Record had been his favorite tug. 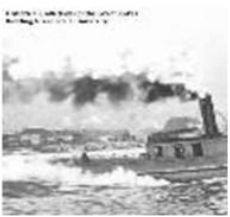 In 1887, Captain Inman had acquired the iron tug Record, christened in honor of the Marine Record published by A.A. Pomeroy in Cleveland, Ohio. Soon the Record was spending most of the winter months in Duluth breaking ice and keeping the water of the bay navigable. The captain’s obituary rightly stated that he had earned a reputation for being an attentive, careful steward of the Great Lakes Towing Company based in Duluth. Captain Inman’s wife May R. Coniff Inman had also been involved. While still navigating earthly seas, Captain Inman had helped May become skillful pilot and earn her pilot’s license from the Duluth District in May 1895. The only woman on the lakes to hold a pilot’s license, May Inman sailed the tug Ariel as master and piloted the side wheel steamer E.T. Carrington on the St. Louis bay and river. A talented marine artist, May Inman could have gone on aboard the Record with her oils and watercolors to paint the ghosts that haunted it and taken her canvas to the Inman home on Superior Street in Duluth overlooking Lake Superior to finish it. The watchman remained at his post on the Record for the rest of the night, but early the next morning he burst into the tug office. His face had turned sail white with fear and his body shivered like he had fallen into Lake Superior. He also insisted that he had heard strange noises in the hold of the Record. He refused to return to the tug until someone went with him. Adding journalistic validation to the watchman’s observations, a reporter from The Duluth Evening Herald recorded on May 27, 1903 that ghostly crewmen had been haunting the Record. These ghostly crewmen were so persistent in their visitations that living tug men working for Captain Inman’s Great Lakes Towing Company left or asked to be transferred to other tugs. Over the next week several men returned with the watchman to the Record to investigate. They found doors that had been left closed standing open and something or someone blew out their lanterns several times. The men heard noises in the hold almost every night, and to complete the haunting, ghostly visitors appeared to other crewmen while they were on watch. Several of the men declared that they would resign rather than remain on the Record. The frightened men thought they knew the identity of the ghosts – the ghosts had to be the men who had died while they served on the Record. The Record had been sunk three times since the Globe Iron Works in Cleveland had built her in 1884. The steamer R.L. Fulton rammed and sunk her at Duluth on June 2, 1898 and three men died. The steamer Joseph B. Neilson rammed and sunk her at Duluth on October 8, 1899, with a loss of one life. Again on November 7, 1902, the steamer Bransford ran her down and she sank at the Great Northern Ore Dock in Superior with the loss of one life, Thomas McAllister who was fatally scalded by escaping steam. Company, at the foot of Seventh Avenue West sent out the Superior and the Abbott. 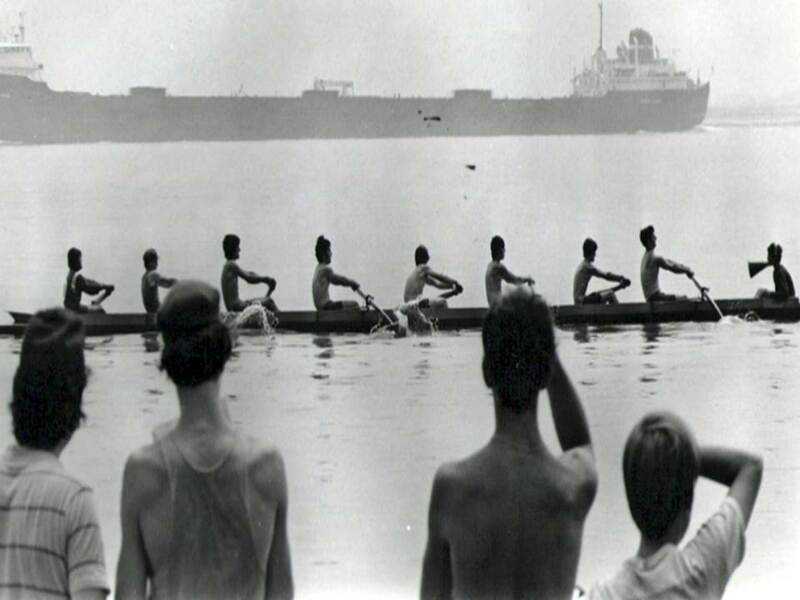 The Record and the Carrington,(the vessel that Mrs. Inman piloted) also from Great Lakes Towing, happened to be in Superior at the time and they joined the race by going out the Superior entry, the tows being equally distant from the two entries to the harbor. The watchman and other dockside spectators on the canal piers obsserved the four tugs racing furiously and the Dowling and the Superior were steadily catching up to the Carpenter. From the south side of the lake, the Record and Carrington made good time and were gaining on the mostly southerly tows. The Dowling maintained her lead over the other three tugs coming from the Duluth harbor entry and secured one of the tows. The Superior from Great Lakes Towing got the second, and the Record, coming from the south, took the third tow, which was closest to the Lake Superior entry. Could that transparent captain that the reporter glimpsed have been Captain Inman at the wheel and the equally ghostly crewman helping him those who had perished with the Record and were now bent on resurrection, redemption and winning? The watchman knew the answer. The Record continued her adventures well into the twentieth century. In 1946 she was renamed Arthur B. Harms and in 1965, the Cathy Ann. She was scrapped in 1975, presumably with the help of Captain Inman and his ghostly crew. Historical Collections of the Great Lakes. Bowling Green State University, Bowling Green, Ohio. Mansfield, J.B., History of the Great Lakes, Volume II, Chicago: J.H. Beers & Co., 1899.